We all know that innovation is crucial to a marketing plan that can change with the times, yet the idea can seem overwhelming when resources are already stretched thin. The good news is that innovation can be made bite-sized and possible even for recruiters with small marketing budgets. Sometimes even one new initiative can significantly improve performance across measures like brand image, reputation, reach, and engagement. With that in mind, here are three ideas that might add a nice boost to your marketing success. Video is undeniably one of the most effective tools available to content marketers: Hubspot research shows that 90% of customers say that product videos help them choose what to buy, and 64% say they are more likely to buy a product online after watching a video about it. But making great videos isn’t enough. For them to be effective, they must not only be housed on the right platforms (e.g., email, website, and social media) but timed to when students are most likely to be there. Birkbeck, a University of London college offering part-time and continuing education, schedules Facebook-delivered videos for times that students are most likely to preoccupied with education decisions – for example during part of the year when students are registering or applying to schools. Birkbeck also makes sure their videos are short and tailors them to students’ needs, such as information on how best to submit applications or on what prerequisites a course requires. What’s nice about this strategy is that the video – designed precisely to be timely – is much more likely to reach target students at the right time than one posted on a website. It allows the college to reach people on the social platforms they already use – rather than wait for users to look for the information on their own. Devoting increased ad spend to such targeted and time-sensitive videos is also key to reaching the right audience on Facebook. This is particularly true for educators and recruiters. Students have particularly profound customer experiences because education is such a large determinant of career success and quality of life – and so they are integral parts of their school brand. It follows that happy students – at a time in which online peer-to-peer recommendations are highly influential – can be instrumental to convincing prospects to enroll at your school rather than another. Developing a brand ambassador programme, in which successful and satisfied students or alumni – ideally with quality social media feeds and a significant follower base – represent your school is an idea that only gets smarter as time goes by. Such students can represent your school in a variety of ways, one of which is agreeing that their contact details be included in marketing emails so prospects can ask them questions directly. Many schools are also putting an “Ask a Student” button on their websites. 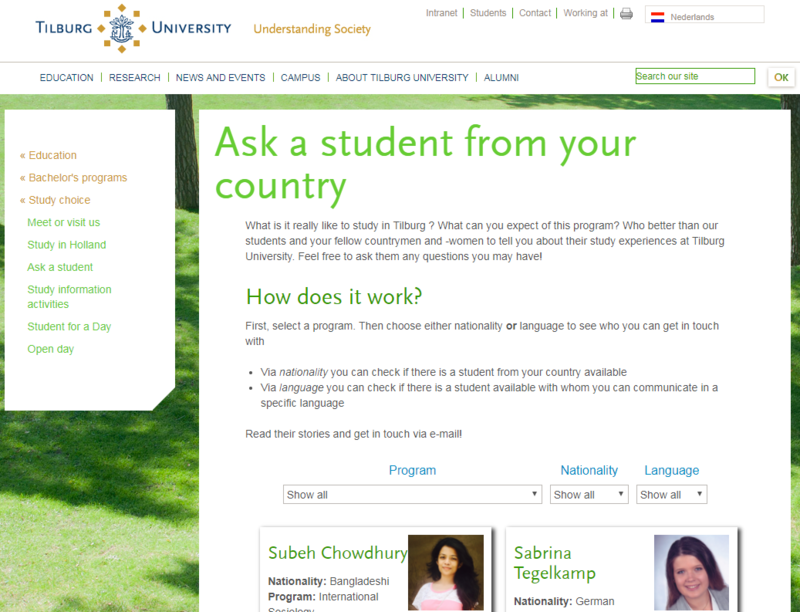 A screen capture illustrating the student ambassador programme at Tilburg University. Like reviews, comments on institutions’ social media feeds are free for all to see and followed by prospects. Students first look at what an institution claims about itself and promises, and then they check to see what other students say – do the comments support or undermine the institution’s message? Because these comments are so important, responding thoughtfully to them is a must. It demonstrates that you are listening, that you care, and that you consider students’ opinions and suggestions in your operations. Of course, not all comments will be positive. Adrienne Weissman, CMO at G2 Crowd, a peer-to-peer business review platform, points out that, “There is not one brand that has only happy customers. It’s common sense. You cannot make everyone happy.” Engaging with negative feedback rather than ignoring it or deleting it shows confidence and authenticity to students who are well aware that 100% positive product/service reviews often indicate dishonesty and concealment on the part of a brand. This student comment on the university’s official Facebook page received no response from the institution in question, leaving the impression that the university was uninterested in the student’s opinion or unwilling to engage with his/her feedback. To tilt the balance toward positive reviews, the key is to not be afraid to ask. If a student raves about something your school is doing in an email or in person, ask them politely if they would post their feelings online and tag your school. This student review on the university’s Facebook page shows how powerful positive student feedback can be. While more positive reviews than negative ones is of course the ideal, keep in mind that perfection is out, and honesty – warts and all – is in, not coincidentally at a time when Facebook’s breach of customer data is on the minds of many. Transparency is becoming a golden rule in business-to-consumer marketing, with recent research showing that 94% of consumers say it influences their business decisions. To borrow an example from outside the world of education, McDonalds’ recent transparency-oriented campaign offers a great example of how even the most negative customer perceptions can be used to show the company’s commitment to change and customer feedback. As well as demonstrating a commitment to answering customers’ questions, McDonald’s was also able to dispel one myth: a video on the much-visited campaign website showed the inside a McDonald’s beef processing plants, showing that its beef patties are – wait for it – really beef, from real cows. This entry was posted in Africa, Asia, Australia/Oceania, Europe, Marketing, Middle East, Most Popular, North America, Regions, South & Central America, Youth Trends and tagged digital marketing trends, student enrolment, tertiary education overseas, language schools, mobile marketing. Good article, Points 2. Ask students to help represent your brand and 3. Ensure that social media is a real conversation, are essential in good (digital) marketing. Students or clients trust their peers word of mouth carried by social media to make purchasing decisions over time. Accordingly, regular feedback from students on their information seeking journey e.g. digital channels, attitudes etc. is required, regularly. Further, this can lead to using consumer or student generated media content (with curation) which is viewed as authentic and trustworthy.